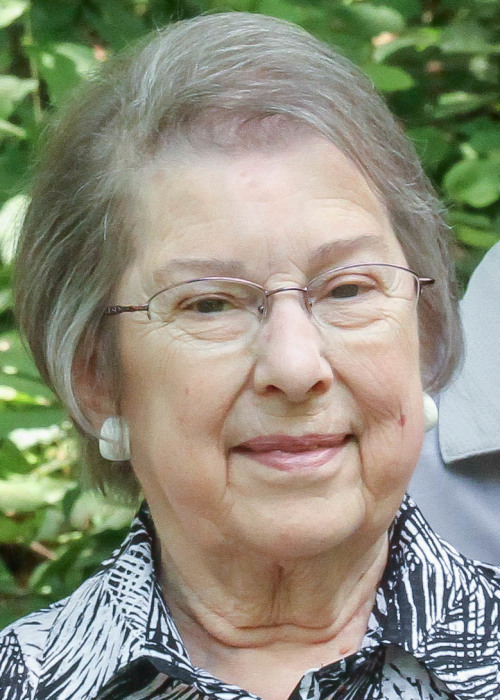 Obituary for Barbara E. LeSage | Peterson Kraemer Funeral Homes & Crematory Inc.
Barbara E. LeSage, 86, Wausau, died Wednesday, March 27, 2019 at Mount View Care Center, Wausau. Barbara was born July 15, 1932, in Wausau. She was daughter to the late Charles and Adeline (Ladwig) Bretzke. On October 10, 1953, she married Matthew “Tom” LeSage in Wausau. He preceded her in death September 24, 1990. Barb loved growing up on Lillie Street in Wausau with her beloved brother Chuck (Charles Bretzke Jr.). The riverbank was great for exploring, tobogganing, swimming, and of course fishing. All were fond memories she shared over and over as we strolled along the beautiful walking path. However, there was little doubt that her favorite memory was roller skating at the Rothschild Pavilion. Carrying her skates, she would walk to Grand Avenue and hop on the bus to the Pavilion. She and her dear friend, June, sewed their own skating outfits and the roller rink was where she met ‘her Tommy’. Barb graduated from Wausau High School in 1950 and was employed at Employers Mutual for a few years. She often mentioned a career was never her desire; she wanted to be a wife and mother. She did an amazing ‘job’ raising four children, with the youngest having special needs and dealing with the crippling disease of rheumatoid arthritis as well. In Sept. 1975 Barb’s life changed again when she began her relationship with Jesus Christ as her Lord and Savior. She overcame life’s challenges setting a beautiful example to others with her steadfast faith and trust in Christ. She was a prayer warrior not only for her family and friends, but for every clergy member in the area. She was part of a prayer chain, listened to many Bible studies, and had a special God-given gift for sending inspirational messages in beautiful penmanship in cards and letters. Her prayer journals, well-used Bibles, and the many notes she has written and tucked in those books are a testament to who she was and how the Lord used her to impact others. Because of Barb’s faith and obedience to the Lord, many of her family and friends will spend eternity in heaven with Jesus. We have no doubt she has already heard these words: ‘Well done, good and faithful servant’. A special thank you for two very dear friends who never stopped calling, visiting, and sending cards and notes knowing they would probably not receive a note in return - June Plant and Lorna Sellin! Another special thank you to every staff member on Gardenside Crossing at North Central Health Care. Your compassion, tenderness, and care are outstanding, and words cannot express the gratitude for what you do every day. Survivors include her children: Christopher LeSage (Karen), Weston, Russell LeSage, Wausau, Debora Osowski (Robert), Mosinee, Patrick ‘Ricky’ LeSage, Wausau. Grandchildren: Joshua (Marlee) LeSage, Wausau, Danielle (Chris) Hanson, Milaca, MN, Caleb (Breanna) LeSage, Wausau, Trystin LeSage, Wausau, Michelle (Kameren) Mikul, St. Germain, Paul Krubsack, Mosinee. Great Grandchildren: Theo and Emmett LeSage, Leila, Ariana and Ezekiel Hanson. Sister-in-law Marie Bretzke, St. Louis, MO, Nephews David (Vicky) Bretzke, Orlando, FL, Steven (Ginny) Bretzke Washington, MO, Ronald (Marita) Bretzke, Atlantic Beach, NC, and Michael (Lindsay) Bretzke Advance, NC. Besides her parents and husband, she was preceded in death by her brother Chuck, brothers-in-law, Jerome LeSage and Francis (Virginia) LeSage, and sisters-in-law Ruth (Roy) Hintze, and Mary (Gerald) Mueller. In lieu of flowers, please consider donating to any of the following organizations that were impactful in Barbara’s life: 700 Club, Wisconsin Right to Life, Salvation Army. Funeral services will be held at 4:00 p.m. on Sunday April 7, 2019 at Christ Community Church, 8100 Alderson St., Weston. Dr. Robin Wilde will officiate. Visitation from 2:00 p.m. until the time of service on Sunday at the church. Burial will be at Restlawn Memorial Park, Wausau on Monday. Peterson/Kraemer Funeral Home, Wausau oversees arrangements.